Create a custom datatype for userdata???? Im wondering if its possible to create my own datatype for userdata with python. I would like to create my own spline datatype if possible. it is only possible to create custom Datatypes or custom GUIs using the C++ SDK with CustomDataTypeClass and iCustomGui. See also you other thread "How to create a cutom data type for UserData? ". Yes that my thread over at c4dcafe. Im not that much into c++. Since its not possible to create a custom data type with python. Would it be possible to manipulate the Spline datatype in the userdata using python then? As you saw in my other thread i want to restrict/clamp the points on the spline. Is this possible then ? So after messing around a bit i see that there is a python node in the expresso editor. i tried adding a python node to my expresso which drives the lip splines. i can see that the python script reads the spline values fine when i change them. however it will not clamp like i want to. is there somethign wrong with my SetKnot ? if I understand correctly you want to create individual constraints for each point? That is not possible with the existing Spline GUI. Yes thats exactly what i want to do. After hours of messing around i finally got it to work. seeing that the SetKnot way did not do anything. 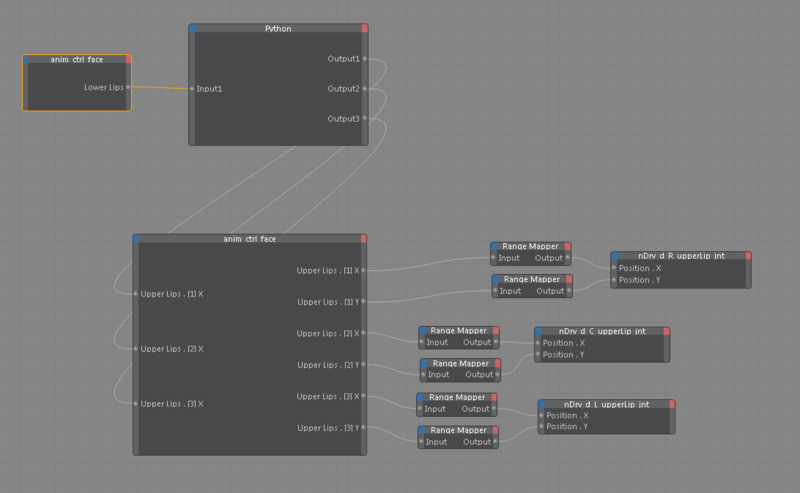 By feeding the output of a Python node back into the obj "anim crtl face" i managed to clamp the values. The 3 outputs are floats. EDIT: the wrong spline is set in the input to the python node. But this ibput isnt realy used so it doesnt matter. This method is not perfect but does the job for me.